So, my landlord's wife had a baby in the basement last week. I knew she was expecting sometime in April. My landlord had casually mentioned to me, "Oh, by the way, if you hear a lot of screaming one of these days, it's just my wife having the baby." They had decided to do the home birth thing, which surprised me since they don't seem like that kind of crunchy granola couple. Also, although I haven't seen the basement of this tiny duplex, I can't imagine it's ideal for birthing babies. It may be that his wife isn't eligible for hospital treatment since she only came to Canada a few months ago. I don't know the details. 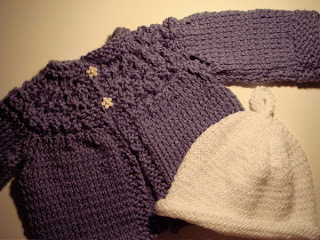 Here's the welcome gift I knitted for the new baby girl. The cardigan was super-easy: the pattern can be found here.